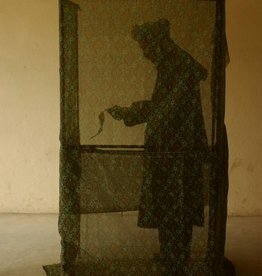 A burqa was hung to dry in a garden in Kandahar, Afghanistan. Jeroen Oerlemans took this picture on May 5th of 2006. The Dutch photographer Jeroen Oerlemans (1970-2016) studied political science at the Amsterdam University and thereafter photojournalism at London College of Communication. As a freelance photographer he covered several areas of conflict: Afghanistan, Haiti, Pakistan and nearly all countries of the Near East (Iraq, Iran, Lebanon, Sudan, Libya, Syria, Israel and the Palestinian Territories). In his latter years he was mostly active in Afghanistan, Libya and Syria. His photographs were published in Newsweek, Time, The Guardian, International Herald Tribune, The Sunday Times, Courrier International and elsewhere. He was represented by Panos Pictures' Panos Network, and by de Beeldunie. On 2 October 2016 the Dutch news reported the fatal shooting of Jeroen Oerlemans in the Libyan city of Sirte, Islamic State’s last bastion in the chaos-wracked north African country. Jeroen was killed while he was out with a team that clears mines in the part of the city that has been freed from Isis control, according to Dutch national broadcaster Nos and Belgian publication Knack. Proceeds from sales go directly and completely to the Jeroen Oerlemans Foundation, that was invoked to keep the legacy of Oerlemans alive and furthermore to realise a scholarship fund for Oerlemans' three children. The print on aluminium will be carefully wrapped and send as an insured package. You will receive an e-mail with a Track & Trace code when the package is on its way. A framed copy is on display at Foam Editions, the gallery on the third floor of Foam Fotografiemuseum.